New York’s hottest and hippest literary ticket. Limit 4 per order. Not eligible for discounts. Following a 2016 sellout The Moth Mainstage returns—new theme and new tellers. The Moth Mainstage is true stories, told live and without notes. The Moth Mainstage celebrates the ability of stories to honor both the diversity and commonality of human experience, and to satisfy a vital human need for connection. It seeks to present recognized storytellers among established and emerging writers, performers and artists and to encourage storytelling among communities whose stories often go unheard. Each curated event features five wildly divergent tellers who develop and shape their stories with The Moth’s directors. Beyond theater, The Moth Mainstage is a community where entertainment and enlightenment merge. 2017 marks The Moth's 20th anniversary year. 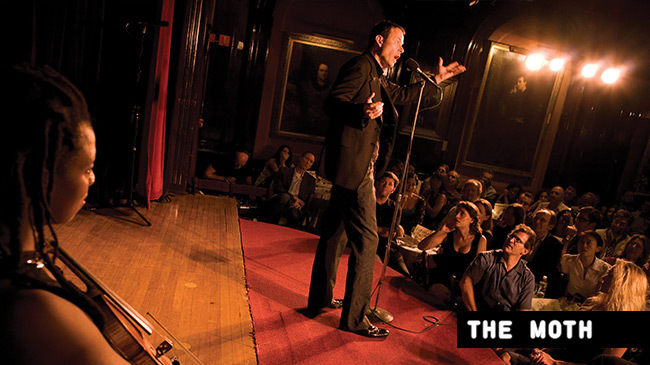 Since its launch in 1997, The Moth has presented thousands of stories told live and without notes. Moth shows are renowned for the great range of human experience they showcase. Through ongoing programs in more than 25 cities, The Moth has presented over 20,000 stories to standing-room-only crowds worldwide and it currently produces more than 500 live shows each year. Additionally, The Moth runs storytelling workshops for high school students and adults in under served communities through their Education and Community Programs and develops innovative applications for Moth storytelling through their Corporate Program. The Moth podcast is downloaded over 44 million times a year, and each week, the Peabody Award-winning The Moth Radio Hour, produced by Jay Allison and presented by PRX, The Public Radio Exchange, is heard on over 450 radio stations worldwide. The Moth’s first book, The Moth: 50 True Stories (Hachette) was an international bestseller and its new book All These Wonders: True Stories about Facing the Unknown from The Moth (Crown) is available now. Presented by City Opera House and Interlochen Public Radio.